Motorola’s latest smartphone has a killer feature that’s going to be hard to beat: A $129 price tag, unlocked without contract. Unveiled today, the new Moto E is the company’s least expensive smartphone to date. It’s not the most powerful Android on the block by any means, but it does come with a decent enough feature set to make it a worthy starter or budget smartphone. The Moto E has a Qualcomm Snapdragon 1.2GHz dual-core processor, 4GB of storage, a 4.3” Gorilla Glass display with 540 x 960 resolution, an “all day” battery, Android KitKat 4.4.2 and a 5MP rear camera. The Moto E makes a good choice if you’re looking for the absolute least expensive smartphone possible without getting a piece of off-brand junk. The phone may look inexpensive, but it doesn’t look cheap – a key distinction. The Motorola Moto E is currently available in your choice of black or white. It has a number of colorful interchangeable backs available for even more customizability. 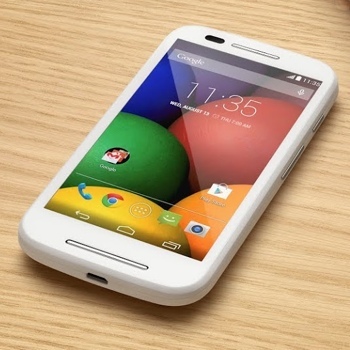 For more on the Motorola Moto E smartphone, check out the brief promotional video below. For other solid value-priced smartphones, take a look at the $179 Moto G and my favorite, the $349 Google Nexus 5.